Easy to make and yummy to eat—just right for any person’s busy day!!! Prepare the batter the night before, keep in the frig. overnight and bake the next morning starting off in a COLD oven. WOW—that’s different!!! Serve in beautiful baskets lined with a pretty napkin and let the guests oooooh and aahhhh over one of your easiest fixed recipes—to go with anything and everything. This is what I made this morning, day after the election. It was so good and I had it with a bit of the crunchy peanut butter and plum jam–both of which I had made very recently. When baking the popovers, I would strongly suggest using a Teflon muffin pan or to stick free spray your ramekins very thoroughly to get the popovers out with ease. Put ingredients in electric blender, in order listed, cover, and blend on high for about 1 minute—stopping to stir down if necessary. Pour batter into prepared ramekins set wide apart on a baking sheet, filling cups 3/4 full. Set ramekins on a baking dish and place in COLD oven on middle rack. Turn on oven to 450 degrees and when it reaches that temp. (you have to watch that part), bake 30 minutes more. Towards end of baking time, but NOT BEFORE because they may fall, check popovers and if they are becoming too brown, reduce temperature to 400 degrees. 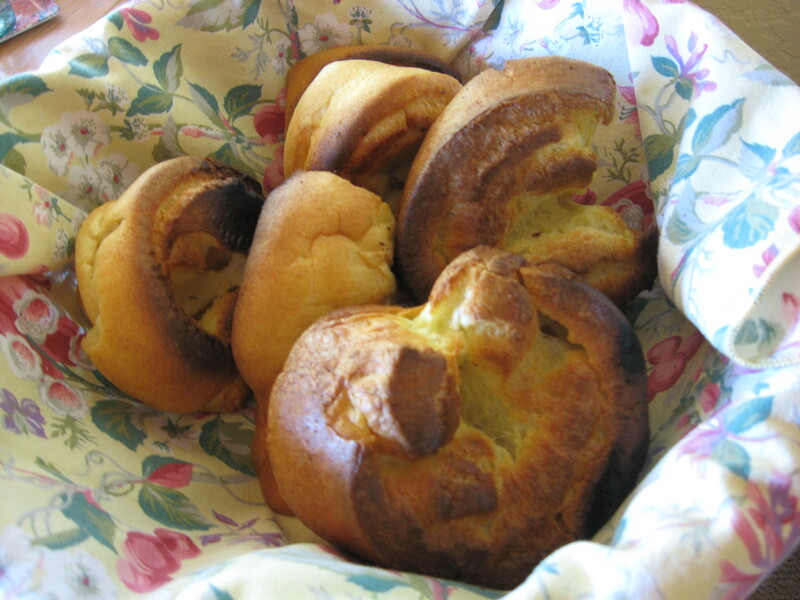 Bake until popovers are well browned and crisp. Hopefully you have a glass inset in your oven door so you can peek without opening the door. You should serve them immediately, but I’ve noticed that they keep just fine for a bit in a 170 degree oven. When you take them out, you can brush over the tops some melted butter mixed with honey and a bit of orange zest and/or just with cinnamon. They are delicious as is and are good with scrambled eggs. They are great smeared with orange marmalade or lemon curd for breakfast or tea. And if you would like the popover itself to be sweeter, try adding a tad bit of sugar. You can even add currants or fennel to the recipe. Currants I add to the batter when in the ramekin and the fennel I add to the batter when I am blending it. For a more savory taste, put some herbs (such as dill, etc.) when making the batter. Then serve them with a stew or meat shank recipe. Once again, imagination is the name of the game. Bon Appetit.